You are all cordially invited to the opening of Elif Erkan‘s show at Weiss Berlin, Bundesallee 221, October 20, 7-9 pm. In Elif Erkan’s (* 1985) sculptures the precise examination of the material and the act of production are always in evidence. The solo exhibition at Weiss Berlin will feature her latest group of works, in which the artist is working with felt and metal. The “felt paintings” are touching upon problems of modern life and constant self-optimization. 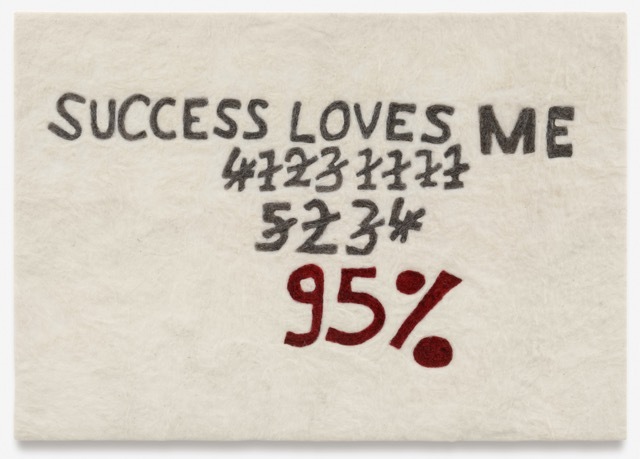 “Does Success Love Me?”, for example, shows a calculation of the numeric value of the letters of the sentence „Success Loves Me” with crossed out numbers. The result is the answer to the question the title begs: 95% – in red felt. Erkan reverses the neoliberal demand to love success by making it the subject and the person who pursuits it the object. The felt works are complemented by tin sculptures. Their production refers to a Turkish tradition that is supposed to banish evil spirits and purify the individual’s energy: melted tin is poured into a bowl that is filled with cold water and held over the person’s head. The shape that the material has assumed is discussed and analyzed afterwards. On the opening night, there will be a performance referencing this practice.